Note: There are many theories about the best way to cook dry beans. I particularly like this one but find whatever method works best for you! Do give this a try if you are not yet in the habit of cooking beans. Cook a lot of beans to refrigerate and use over 5-6 days and/or freeze for future use. Let the beans cool in their cooking liquid for at least 1-2 hours. This vastly improves their flavor and texture. You do not need to refrigerate them while they’re cooling. Just leave them in the pot on the stove (with burner off) until they’re cool. Then refrigerate what you think you’ll use up in 5 days and freeze the rest. Keep as much of the cooking liquid as you can–it’s wonderful in soups, as a broth on its own, to loosen up beans when making a spread or refried beans, etc. and it also protects them in the freezer. 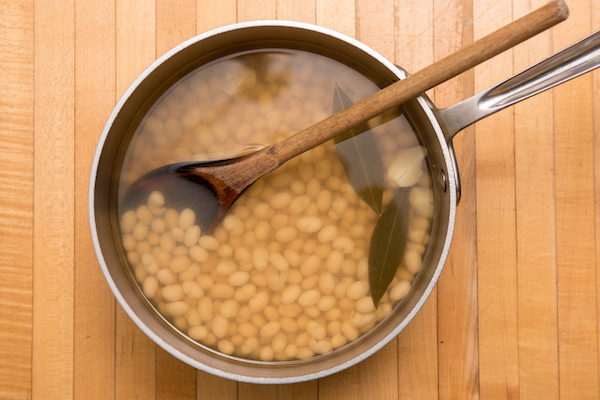 Place dry beans in a bowl covered by about 4 inches of cold water. Soak for 4-8 hours (or up to 24). If you can’t get around to cooking them after 24 hours, you can drain them and refrigerate them for another day before cooking with no ill effects. Drain beans and put soaked beans in a large pot and cover with cold water by several inches. If you have time, add a couple of whole, peeled garlic cloves, a bay leaf and a chunk of peeled onion, but skip if you don’t. Bring to a boil, turn down to a simmer and let cook covered until the beans are tender, stirring occasionally (this helps prevent some beans from softening before others.) I add salt towards the end of the cooking time and when you do add salt, be generous, as in at least 1 teaspoon sea salt for every 1 cup or so of dried beans. They will likely need more still. 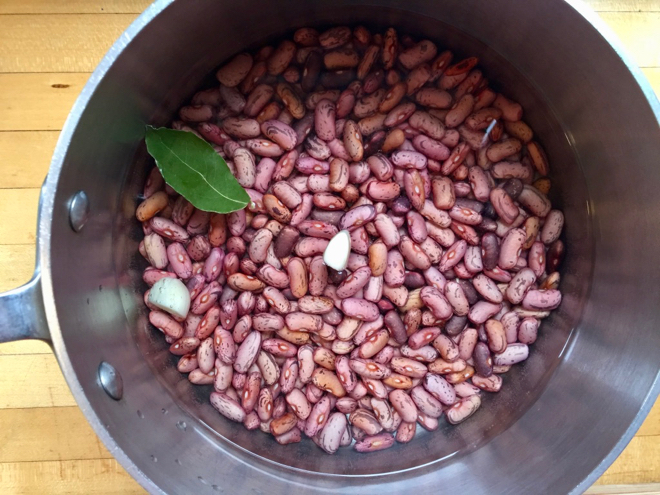 The time it takes for the beans to cook will vary depending on the kind/size of bean and the freshness of the dried beans. Pinto types typically take about 30-35 minutes, smaller white and black beans as little as 20-25. Let beans cool in their liquid (see above). Cooked beans keep in the refrigerator for 5-6 days and for several months in the freezer. To freeze: Fill container (1/2 pint, pint or quart—smaller sizes are good for quicker thawing and for quesadillas, burritos, salads & larger ones are good for soups/stews/chilis) with cooked, cooled beans. Cover with cooking liquid and freeze. Remember to put them out to thaw on the counter in the morning or the night before you need them or run hot water over the container and put the whole chunk of frozen beans/bean cooking liquid in a saucepan and thaw on low heat. Beans do not thaw well in the microwave—they go bad very quickly after thawing this way.